Catherine Constance: Brown Paper Boat. . .
Brown Paper Boat. . . Rain rain go away, if you don't I'll sail away. . . The owl and Miss Cat went to sea in a beautiful brown paper boat. . .
Hello everyone. . . . . .I spent yesterday, far away on a beautiful sunny island. Just me and Owl, we had to get home for tea as we had forgotten to pack the tent. Who knew clouds could hold so much water. It has rained and rained and rained for days. Well I decided I had enough so I built a brown paper boat. Packed a picnic and sailed away with owl to find where the sun was hiding. We found Sun on this beautiful island. He said he was having a little holiday, he was tired of getting up early every morning and whizzing round the world every 24 hours. I told him he needed to come back with us because the clouds where making a terrible mess everywhere. Owl and I managed to persuade him to come home. I promised to make him a nice cup tea and some fairy cakes with lots of sprinkles on... Sun likes fairy cakes...yellow ones, of course. Sun is happily playing in my garden as we speak, so I've put my washing out. Adorable! I LOVE your little owl of course! Mmm...fairy cakes! Aaaah that is so wonderful. I wished we could just sail away like that! Bellissimo lavoro, delicato e poetico! 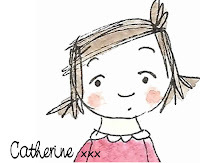 Oh Wow Catherine..super enchanting..what a visual treat..such spectacular little beauties! What an adorable little sailboat..I am smitten with this super charming post today! magical and blissful! You are awesome! That sailing scene that you created is spectacular. I can see it being used to animate a cartoon about the adventures of Miss Cat and Owl. Blessings! 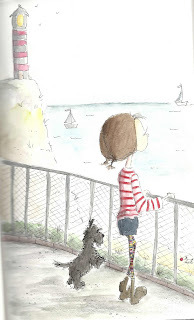 I love your little girl character with her little dog! ^_^ So adorable! 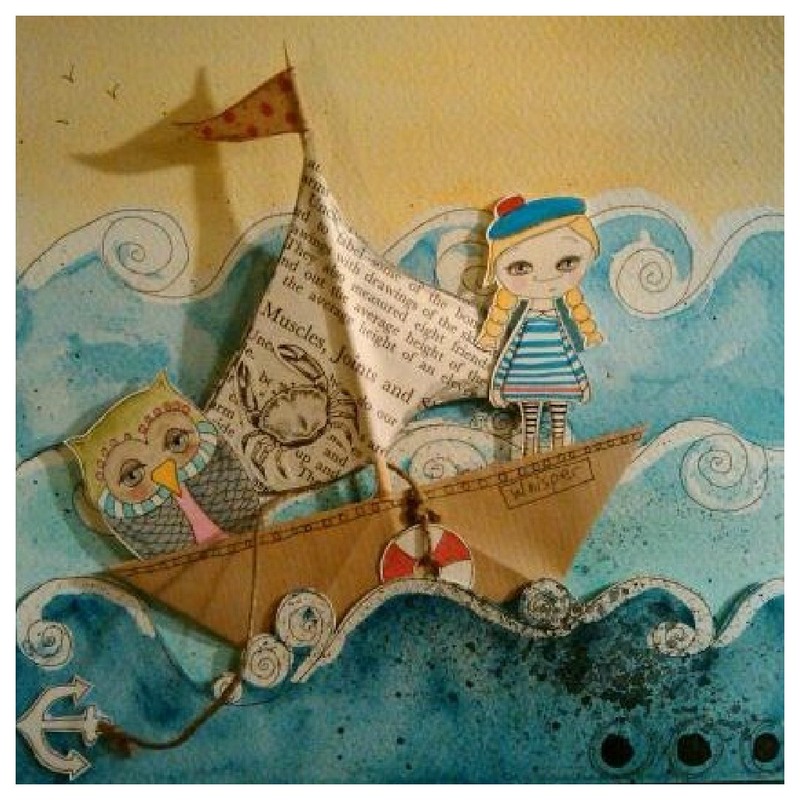 I LOVE your boat collage with its curly waves, very creative! Oh it's fantastic! I love love love the owl. Creative!! your imagination and creativity are so amazing! Love the story and the pictures today! sweet drawings and looks like a fun way to pass a rainy day. All so very sweet! Lovely art work Constance, so very creative! Absolutely adorable! Love your whimsical, wonderful art! 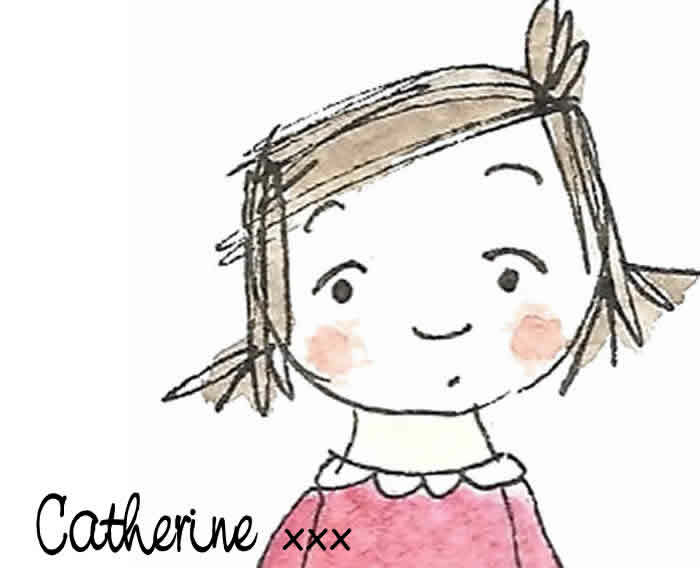 As usual, Catherine, your posts are adorables. Love the girl, the doggy and the seascape! Really lovely! I like the colors here, a little browner than usual? The owl is yummy? 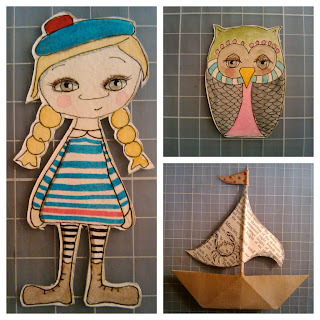 Your little brown boat and the little lady-captain as well as the first-mate-owl are so incredible cute! And because of the perfct matching background this picture looks so lovely adorable! As Tracey already said I thought of a kids book as well. I love it! Sailing across the sea to see a friend. .
101 painted faces. . .
Squiggles and carrots. . . Ducks and puddles. . .